There are any number of starting places when working on a handspun, handknit project. One way is to envision exactly the end result you want and then find the fiber, spin it, and knit the piece. Or you can see the hand-painted fiber, fall in love, contemplate how to spin, spin the fiber, contemplate the yarn and then knit the piece. In this case I chose the latter. I was at a spinning event and Lisa Milliman of Dicentra Designs was a vendor. I kept wandering by her booth and finally succumbed to a 5 oz piece of hand-painted top named Rusty Nails. There were beautiful clear colors of Gold, Rust, Burgundy and Dark Turquoise. I loved each color individually and the way they were placed next to each other was irresistible. I contemplated the fiber for a while, and in laying it out it looked like the fiber had been laid out back and forth at a given length horizontally, and the dye applied vertically. When the top was laid out it then had a symmetrical appearance. So how to spin? 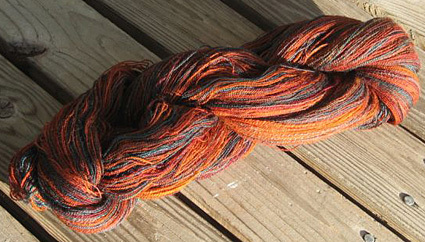 Since I loved the colors, I did not want to approach the spinning and plying randomly and have lots of visual blending, making a muddy looking yarn (although it would no doubt be beautiful). Margaret Heathman teaches a class on a variety of ways to spin hand-painted top to keep the colors clear. One is to spin and work with the singles; the second is to spin a singles and navajo ply; third is to split the top into two individual pieces, spin and ply. Since I find navajo plying fiddly, I rejected that. I worry about the durability of singles and I want to have this for a long time. So I was willing to try the split it in half and ply together. First I determined which was the head end. If you pet top, one way is smooth and the other is rougher. If you spin from the end the top was created, it drafts smoother and easier. Starting at the head end, I divided the top in half vertically. I worked alone and quietly and slowly. This gave me the most even division I could muster. Just grabbing and pulling hard and fast may give you a very uneven distribution -- you could end up with a 90/10 split at the end instead of the 50/50 you're aiming for. Next I spun my habitual lace weight, which works out to a singles at about 6,000 yards per pound and a 2-ply yarn at 3,000 yards per pound. I spun about an hour a day, every day until all the yarn was spun. It took about a week. By continuing to spin every day (and not spinning anything else during the time) my hands could remember what they were doing and the work stayed consistent. Before plying, I wound the yarn onto little plastic bobbins. I read somewhere that if you ply the singles in the same order as you spun them, you will have a smoother yarn. Also if my division or spinning diameter was off at any point, starting at the end would be off. So thought I’d start plying at the start. As you can see from the skein, the colors look clear and bright. There are 1,000 yards of this lovely yarn. Next came the decision of what to knit. I like to simplify my choices by making them A or B. In this case I wanted to knit a scarf or shawl. 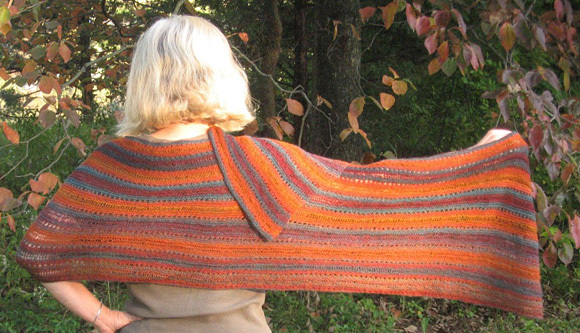 I believe that a shawl can be about the yarn or it can be about the knitting. Since the color is so clear and compelling, it would have to be about the yarn color. If I knit a complicated lace pattern, the only thing anyone would see would be the stripes of colors. In designing the shawl, I wanted to make sure the piece was long enough. By casting on the longest side, I am ensured of having a long-enough shawl and there will be long stripes along the shaw, giving it a more woven appearance. After a gauge swatch, I cast on and started a few rows of garter stitch. I chose two very simple lacy looking patterns to give a little bit of interest to the knitting. I chose holes just YO, K2 tog, and the elongated twisted stitch. These are simple and horizontal so they work with the colors while not competing. This was one enchanted project from start to finish. It all just worked out for me. I loved the top, the division was even (until the end) and the spinning was soothing and good. While knitting and deciding on my simple pattern, I noticed that the colors were lining up with the yarnover holes as well as the elongated stitches. Don’t think I could plan that one. Your choice of commercial laceweight yarn. Rows 1-6: K all sts. Row 7: K3, [yo, k2tog] to last 2 sts, k2. Rows 8-14: K all sts. Rows 15 & 16: K3, work Long Twisted Knit stitches to last 3 sts, k3. This triple-wrap method produces a firm, twisted, elongated knit stitch. It's a bit fiddly to master, but moves quickly once you've got the hang of it. The resulting stitch will be longer than usual, and have a twisted base. Insert the right needle to knit and wrap the yarn around the needle, as normal. Then bring the yarn towards you and over the left needle, and again wrap it around the right hand needle as normal. Pull only the very last wrap through the stitch on the left needle. See also the “Double Elongated Stitch” in Mary Thomas's Book of Knitting Patterns. Bring the working yarn in front of the left needle (as if to purl). Bring the right needle over the working yarn, and insert the tip of the right needle through the first stitch on the left, as if for a knit stitch. Insert the right needle into the stitch as if to knit, bringing the tip of the needle over the working yarn on its way through to the back. Make sure the point of the right needle lies over the working yarn. Drape the working yarn over the left needle, and wrap it around the right needle as normal. Pull only the very last wrap through the stitch on the left needle. See also the discussion of “Long, twisted knit stitches” in Knitting in the Nordic Tradition, by Vibeke Lind. Work Elongated Open Garter Pattern until piece is desired width, ending after Row 6 or Row 14. Charlene Schurch is the author of Mostly Mittens, Hats On!, Sensational Knitted Socks, More Sensational Knitted Socks, Little Box of Socks. 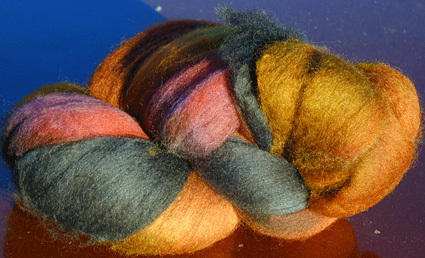 She lives by the water in FL and CT where she spins, dyes and knits.